On Friday, Krystal and I stopped by Reiss headquarters in London to meet with the PR girls. It was so fun to hear about what they have coming up for holiday (think lots of pretty party dresses)! The Reiss team was super nice and even let us pick out a few pieces to take with us. I had actually already visited Reiss earlier in the week and picked up this fabulous leopard belt and this hat, but at headquarters I picked up this laser-cut skirt and this pretty blouse. Some other pieces worth checking out include this red lace number, this classic cape, and this neutral cashmere jumper. Also obsessed with this leopard coat! Stay tuned to see how I styled my new pieces, but click here to discover all the amazing pieces from Reiss today! Loving your picks, specially that gorgeous coat. like usual, your edit has me adding quite a few things to my wishlist. i absolutely ADORE the rebecca taylor dress, the kate spade sunnies, and the ferragamo flats. hope you’re having a wonderful time in london!! Oh my! This is such a sinful list to look at! 3, 11,16 are the beauties for me! Those Feragamo bow flats are everything!!! And I need that faux for scarf in my life asap! I love all of these beautiful light colors! 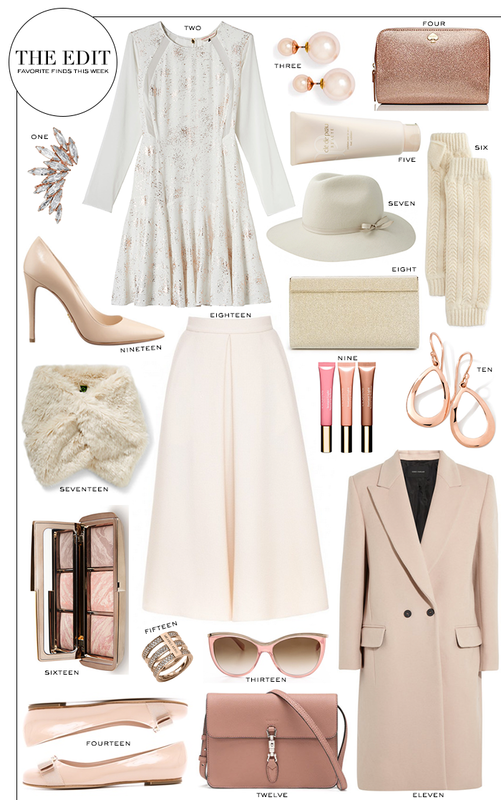 Blush is so pretty to wear, but I love that gorgeous white dress! Great picks! I have had my eyes on those earrings for a long time. I am also a little obsessed with that blush purse. I hope you are having a wonderful day in London! Ooh can’t wait to see how you style that amazing laser cut midi! Slightly envious! Love the Lublu Midi skirt! These picks are great! Love all these…mainly because of the blush tone. I want it all. No. Really. All of it.